Rayce is a sweet lovable dog who treats everyone as her long lost best friend. She is energetic, but settles down well after a walk. She has been exposed to many dogs and does well with dogs that won’t try to engage her in play too quickly. She currently lives with an 80 lb mastiff and 2 small chi’s. NOT good with cats. 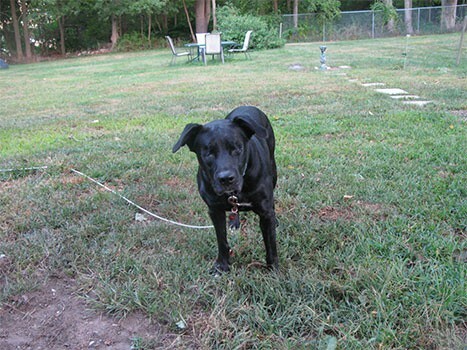 7/14/15 Update: Rayce is a sweet, lovable dog who treats everyone like her long lost best friend. While she is energetic, Rayce is happy to spend most of day hanging out on the couch or laying at your feet. Rayce loves humans, large and small, and is a very low maintenance dog. She gets fear aggressive around other dogs, and most likely cats. Her aggression towards other animals likely stems from an abusive history but this behavior has improved over the last six months. Rayce is truly a wonderful dog and deserves a loving home. 9/16/15 Update: Rayce has now moved to a new foster home and is doing great! Although she doesn’t appear to be aggressive towards other dogs, she also seems to have no desire to be friends with them or to socialize. She wants to be with her human! She absolutely loves people and would make someone a wonderful companion. She enjoys long walks and hiking but also likes cuddling too. Very quiet and clean in the house. A real sweetheart! The lack of sight doesn’t bother Rayce at all though. She is a very smart girl who learns new surroundings quickly. Interesting too that if she thinks she has found a “critter” in high grass, she will raise one leg and her tail points straight out. I believe Pointer may be part of her heritage! Whatever the breed mix though, Rayce is an adorable girl looking for her very own person to love. Is that you? Rayce has now moved to a new foster home and is doing great! Although she doesn’t appear to be aggressive towards other dogs, she also seems to have no desire to be friends with them or to socialize. She wants to be with her human! She absolutely loves people and would make someone a wonderful companion. She enjoys long walks and hiking but also likes cuddling too. Very quiet and clean in the house. A real sweetheart! Rayce is looking for her forever home. If you think it could be yours, read more about Adopting from BDRA before submitting your application below. BDRA relies on your donations to rescue blind dogs around the United States. Please consider giving in support of Rayce.